Abstract: Resocialization and reeducation of jailed young delinquents belongs to the most important tasks of the imprisonment sentence. Its efficacy depends on the quality of penitentiary interventions which should respect the personality differences of juveniles. The fact is, that the application of reeducational and resocialization processes, pedagogic and correctional activities in Imprisonment Execution House is held on the basis of voluntariness, actual accessibility and enterprise of employees. There is relatively large amount of intervention programs in Imprisonment Execution House, but they are applied without relevant indications and consideration of offender’s specific characteristics. The aim of this study is therefore to identify discriminative psychological, socio-economic, educational, cultural, family, criminal, etc. characteristics of imprisoned delinquents which could differentiate prisoners into specific groups and consequently to outline the key areas for penitentiary intervention. Juvenile delinquency belongs to those problems of society whose methods of solution are quite difficult. Basically, there’s no possibility of having crimeless society cause as long there are rules and law present, there are always some individuals that break them. In spite of that, every society tries to eliminate this negative phenomenon. The problem with juveniles is more obvious because of several reasons, the weightiest one is that younger generation is considered to be the hope and the future of society and any abnormity or pathology is perceived as a serious threat for further social development. Of course, juvenile criminality causes problems also in economic, legal etc. spheres, too. 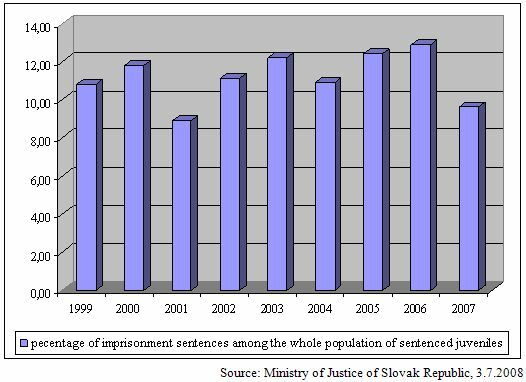 Statistics referring the state of criminal offences seem to give optimistic numbers in Slovak republic. There is obvious declining crime rate of this part of population (see graph nr. 1). This optimistic trend is rather misleading as it doesn’t consider descending population curve which is typical for many European countries. 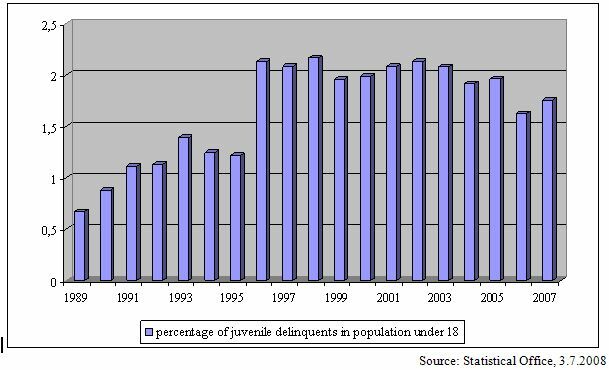 When counted the number of sentenced juvenile delinquents against the number of young population below 18 years of age, we must admit that there is not so steep descent of percentage of young people who commit the crime (see graph nr. 2). The situation is even worse when considered the fact that the number of offenders doesn’t copy the number of committed offences – the number of these is several times higher 1. Except this, criminologists do not reveal and register all offences; there are a lot of those whose perpetrators are unknown, or because of their age somehow excused before the investigation is initiated – either by parents or sometimes even by the victim. The situation is not better in the most problematic group of offenders – jailed delinquents. 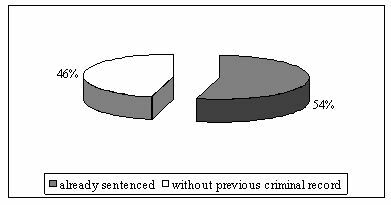 Even though the imprisonment sentence is used for juveniles only in minimum cases, there is still relatively big number (see graph nr. 3) 3 of those who commit such crimes that represent a serious threat for society and for whom other ways of correction (except the prison sentence) failed. According to the § 97 of Criminal Law (Act nr.300/2005 Z.z. ), the primary goal of prison sentence is to rehabilitate juvenile to a citizen of high probity and to act towards prevention of illegal offences. Inflicted punishment ought to lead to a regeneration of destructed social bounds and to incorporation of juvenile into the family and social environment regarding his mental and moral development, personal characteristics, physical health, family upbringing and surroundings which he came from with the parallel prevention of negative influences towards juvenile and protection of society against criminal offenders. Later on, the § 72 of the Act nr. 475/2005 lays down the need of differentiation within penitentiary activities according to specific characteristics of prisoner. The only differentiation which is presently realized in imprisonment execution houses is the division into four groups (1A, 1B, 2A, 2B) regarding the prognosis of resocialization (juveniles with good-1 or worse-2 prognosis) and intellectual ability (A-average and higher levels of intelligence, B-levels under the average). This rough differentiation might be useful when dividing juveniles for purposes of inner structure of the imprisonment house, but is definitely insufficient for penitentiary intervention. Besides this, application of re-educational and re-socialization processes, pedagogic and correctional activities in Imprisonment Execution House is held on basis of voluntariness, actual accessibility of prisoners and enterprise of employees. There is relatively large amount of intervention programs in Imprisonment Execution House there, but they are applied without relevant indications and consideration of offender’s specific characteristics. Efficacy and influence of offender’s atonement unnecessarily drops down what demonstrates the number of relapses after release from the imprisonment. At the same time professional literature and practice in the area of psychological therapy and correction offers enough information on the topics where, how, and by which instruments effectively act on a suppression of some problems connected with young delinquents. It seems that in spite of disadvantageous circumstances in imprisonment execution, it is still possible to realize relatively big amount of correctional activities. Their efficacy, however, depends on the quality of realized psychodiagnostics, which has a potential to identify key and corrigible problems of every imprisoned juvenile. Research was realized on the whole population of juvenile delinquents in Imprisonment Execution House for Juvenile in Slovakia, which is placed in Martin-Sučany. From the research were excluded two boys who did not speak Slovak and all those which age exceeded the limit of 18 years 5. The basic characteristics of the research sample present following graphs and specifications. Except the mentioned information, research sample is constituted by the juveniles coming out mainly (62%) from small towns or villages under 10 thousand inhabitants and from dysfunctional families (55,2%); they belong to Slovak nationality (94,8%), and the majority (60,3%) acknowledges their membership of Gipsy ethnical group; 48,3% of them finished compulsory education in lower grades ten usual ninth grade and 19% attended Special Basic School; the average length of prison sentence was 26 months, and the offence was usually (82,8%) committed in a complicity. - complex cross-analysis of data from police records and documents made out by social workers, educators, the medical references (if present) together with administration of Semistructured Anamnestic Interview and Short Questionnaire in order to gain reliable information on family, social, educational, criminal, economic, etc. background of every offender. All data from every method were collected and 47 scale variables were put into Hierarchical Cluster Analysis identifying the separate specific groups of delinquents from the research sample (see table 1). 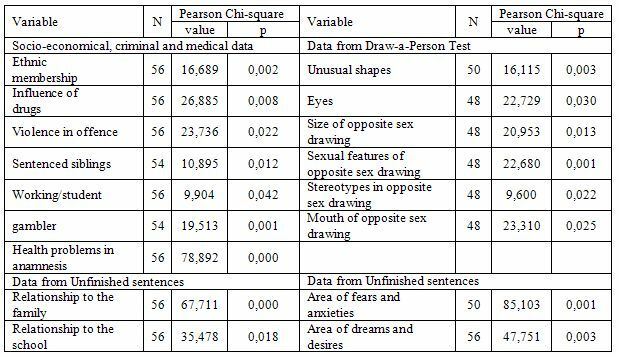 Kruskal-Wallis Test for several independent samples was used to identify the statistically significant differences between groups in scale variables and Pearson Chi-Square Test for nominal variables (see tables 2 and 3). Hierarchical Cluster Analysis identified three groups of delinquents (see table 1). The tables 2 and 3 show the statistically significant differences between three identified groups of delinquents. From the list of several nominal variables were chosen (see the table 3) those which contributed to overall portrait of the group type constructed from the scale variables. -	from functioning complete families, but with the lowest level of communication. From mentioned and others important characteristics the profile of Chronic thief was constituted. Member of this group is relatively old and therefore it is less probable that his offence has been a puerile act. His delinquency is also repeated and it seems that is not a result of psychiatric illness or serious personality pathology (present feelings of guilt). He comes from complete family and usually commits the nonviolent crime under the influence of alcohol. The majority (more than three quarters) of the members of this group has been jailed for an act committed in the time of probing period 8 . It seems that for this type of delinquents the threat of imprisonment was not strong enough to prevent another criminal act. -	have the most positive relationship with the family and long for love and partnership. This group has been named Non-assimilated poor as the majority of problems becomes from the type of surroundings offenders are coming from. Isolation from the majority, unemployment, diametrically different style of living, and outcoming unwillingness to keep the norms of majority handicaps juveniles in contacts with the society. Lower intelligence caused partly by cultural handicap, but also by the lower intellectual capacity, low interest in education, present cerebral dysfunctions and drugs misuse form the background of their criminality. Third type of delinquent was: -	the youngest from all groups -	sentenced with the longest punishment -	with minimum of previous offences -	the most intelligent committing serious crimes of violent nature -	typical through the minimum of positive bounds to his family -	gambler with the biggest number of psychiatric problems in anamnesis -	characterized by aggressive features -	student with uncertain ideas about the future living levity life. As this group was typical with its relatively high intelligence, good social adaptation, but on the other hand by aggressive tendencies, and serious, violent offences, its representative has a character of Socialized aggressor. Member of this group is able to function in society – he is bright enough to understand rules and law, but because of aggressive features of his personality and lack of responsibility commits violent offences. His criminality is therefore based more on his personality features, than caused by unappropriate surroundings. Even though the first type of delinquents seems to represent the less threatening offender for the society, proposals for resocialization and reeducation are nearly the most complicated. Due to the highest age from all groups any intervention is more difficult as the possibility of modification of behavior or personality features decreases wit the age. Except this, analysis of this group found out that their members do not suffer from serious personality disorders nor have destroyed family background. The fact the most of them were sentenced during the probing period shows the unfunctionality of the threats of punishment, too. On the other hand, it seems that prison as an extreme type of punishment could be effective prevention. Researches of O. Lobodáš (in Onrejkovič 2000) show considerable differences in behavior after the release from prison between those delinquents who left imprisonment house after the full time of sentence and those who were released earlier under the condition. During the critical period 10 of one year after the release, only 16% of conditionally released relapsed again in contrast with the other group (which spent all sentence in prison) where the number of relapses was nearly three times higher (43%). In spite of intensively discussed problem of jailing young delinquents 11 (mainly for such offences as theft) it seems that there are some considerable reasons 12 for imprisonment. Chronic thief commits the crime deliberately and with full consciousness; his behavior is not driven by pathology and his abilities for adequate social functioning should not be extremely impaired due to relatively stabile family background. His criminal carrier is probably rather an outcome of loose relation to norms with the combination of disadvantageous 13 social surroundings and alcohol intoxication. He is able to reflect the wrongness of his behavior, but seems to have not enough reasons to act legally. Considering real conditions and potentials of system and professionals in imprisonment houses there are two potential areas of intervention in this group of juvenile prisoners. Except the very needed intervention in the area of alcohol misuse, it seems to be apt that imprisonment should enure repulsively. Paradoxically, from this point of view for this group the jail occurs as the most reasonable from all three mentioned groups. Low level of intelligence, poor education and social skills of the second type of delinquents show the targets of intervention which can be simplified into four main areas : disaccustoming of drugs, social assimilation, intellectual mining, and preparing for employment. So far, the conditions for professional treatment of drug abuses are very good in the imprisonment houses. Situation is more complicated in other three areas. The level of education in the group of Non-assimilated poor is very low. Illiteracy, unmanaged Slovak language, difficulties with reading and writing do not occur rarely. It is essential to operate in this area, as there is no possibility of appropriate functioning in the society without such basic skills. Changes in level of intellect during adolescence are hardly realizable, therefore the precise analysis for identification of intact structures of intelligence is needed. Finding out the strong (or even not handicapped) skills helps to operate on a relatively firm basis. This can be a starting point for educational activities and furthermore for occupational training. Recurrent daily rhythm containing educational, working, and even hygiene habits which absent in previous life might prepare members of this group for everyday life. The imprisonment house substitutes the goals which should have been reached by family, school and wider social background of prisoner. The question is, whether this is the optimum way of resocialization. It is not uncommon that all gained skills and habits disappear after the release, or that the exceptional recurrence, provided food and care works counterproductively. It demotivates youngster to act toward his independence and maturity. Changes provided in natural surroundings would be therefore more effective and resistible, but hardly realizable. Improved and wider system of post-penitentiary services (protected workshops and shelters) could facilitate the reinforcement of changes set in Imprisonment Execution House. High levels of aggressiveness that have demonstrated even in the character of criminal offences combined with the poor relationship with the family were typical for the third type of delinquents. Members of this group seem to display accented types of personality with intact intelligence and problems with the self-control. Regarding this problem, their delinquency seems to have its roots in dominance, aggression and impulsivity that are usually relatively stable features of personality. Due to the age of imprisoned boys it is nearly impossible to rebuild the character of their personality. Furthermore, the fact their unacceptable behavior led them to prison reflects the seriousness and stability of mentioned features. Therefore, the goals of reeducation and corrective activities of socialized aggressor should be focused on the control of the behavior and should teach young delinquents how to vent their aggressiveness in appropriate and acceptable ways. Combination of accented personality with the highest number of psychiatric problems in anamnesis from all three groups focuses an attention on precise diagnostics of potential psychiatrics problems, which should be solved or controlled at first. Aggressiveness can be caused by many factors (frustration, learned behavior,…) that are too difficult to identify and even harder to change. Therefore the intervention should be concentrated on acquiring sills of controlling aggressive attacks and other forms of dangerous behavior. 1. One offender is usually prosecuted for more than one criminal offence. 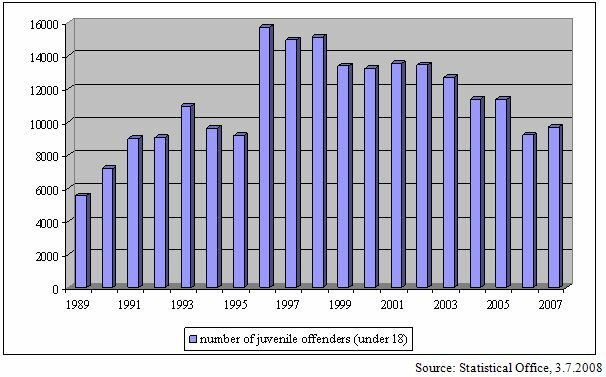 The average number for last ten years varies from two to three offences per juvenile offender (Ministry of Justice, 3.7.2008). 2. In spite of firm conviction of police and public, that this change was needed and positive, psychologists and workers in imprisonment execution houses are not quite sure about the propriety of this change. Juveniles at age of 14 are psychologically (emotionally, socially, intellectually, etc.) immature and at the same time (mainly in cases of serious violent offences) their personality already displays pathological features or tendencies. Such intervention is difficult and complicated in many ways and requires specially trained team of experts. The system of reeducation, resocialization, and correction set by the official legal institutions after the trial proceedings seems not to be ready yet for such intervention. 3. It is obvious, that the curve of number of juveniles sentenced by imprisonment acquires the character of 3-years long waves with the minimum number on the bottom and maximum on the top. Three years period is not explained yet (it might be a coincidence as well), but the important fact is, that the amplitude in each wave reaches higher and higher numbers in each period. 4. As nearly all characteristics of male and female delinquent population differ (motivation, types of criminal offences, personality deviations, etc.) it is nearly impossible to realize one research for both sexes. Nevertheless, the same method can be used within female population with specific conclusions, of course. 5. It happens, that in Imprisonment Execution House for Juveniles there is a lot of delinquents above 18. As long as they were sentenced as delinquents (means they committed the crime sometimes between 14 and 18 years of their age), they have to serve the sentence in institution for juveniles. Even though the sentence might last longer (over the age of 18), it is common, that the youngster stays in the Imprisonment Execution House for Juveniles even after the age of 18. Only when the sentence is too long (above the age of 21), or the personality/behavior of already adult prisoner is not compatible with the imprisonment-life of juveniles, he is displaced to the Imprisonment Execution House for adults. The reason, why these were excluded from the research is the legal delimitation of the term “juvenile delinquent”. 6. The absence of 14- and 15-years old delinquents in the research sample is caused by the relatively smaller amount of this age group in the population of juvenile delinquents as well as by the fact that it takes relatively long time from the legal prosecution until the juvenile gets to imprisonment house. Eighteen years old juveniles included in research gained this age during the realization of the research. 7. Considering the large amount of frequency tables needed for explanation of the type of differences between groups, they were not exposed here. The character of differences is obvious from further explanation of the “types of delinquents”. 8. This means that juvenile has been sentenced for some tort already for which he has been treated with the conditioned sentence. During this “probing” period he committed another crime. 10. Statistics show, that the biggest number of relapses appears within the first year after the release from imprisonment house- Later on, the number drops down quite rapidly and the majority (55%) relapses emerges to five years (Lobodáš in Ondrejkovič 2000). 11. Reference to theories represented by opinion that the jail can not make a positive change in behavior or in personality. 12. Of course, except the very important one, which actually led into imprisonment sentence: as long as there is a sentence of conditioned punishment set and a person in probing period commits another crime, Slovak law doesn’t allow to give other than unconditioned sentence with the length of both sentences aggregated. 13. Surroundings from lower social stratums with higher unemployment, poorer social network and education, accepting illicit ways of gaining means or goods, etc. ALTMAN, Z. Test kresby postavy. Pracovný materiál. Praha, 1998. BAKALÁŘ, E. Metodika 9202. Metodika vyšetrovania a posudzovania voličov motorových vozidiel dopravnými psychológmi. Bratislava : Asociácia dopravných psychológov, 1993. DAMMER, Č. Kresba lidské postavy. Materiál autora. Liptovský Mikuláš : Oddelenie sociálnych služieb Vojenskej akadémie SNP, 1995. DAVIDO, R. Kresba jako nástroj poznání díťete. Praha : Portál, 2001. EBER, H. - CATTELL, R.B. 16 PF – šestnásťfaktorový dotazník. Forma E. (T – 24). (v úprave KOLLÁRIK, T.) Bratislava : Psychodiagnostika, s.r.o., 1994. FRIDRICH, J. - NOCIAR, A. Test ruky. Príručka. Bratislava : Psychodiagnostika, 1991. HURBAN, R. Prevencia kriminality detí a mládeže vo výchovnom poradenstve. In ONDREJKOVIČ, P. Otázky kriminality mládeže. (Zborník z medzinárodnej konferencie o kriminalite mládeže) Bratislava : Iuventa a MV SR, 2000. Pag. 213-219. LOBODÁŠ, O. Spôsob zaobchádzania s mladistvými odsúdenými a ich príprava na život v spoločnosti. In ONDREJKOVIČ, P. Otázky kriminality mládeže. (Zborník z medzinárodnej konferencie o kriminalite mládeže) Bratislava : Iuventa a MV SR, 2000. Pag. 135-150. MINISTRY OF JUSTICE of Slovak Republic [online] dostupné: http://www.justice.gov.sk/wfn.aspx?pg=r3&htm=r3/statr.htm, (cit. 3.7.2008). Raven, J.C. - Court, J.H. - Raven, J. Štandardné progresívné matice (T-16). Bratislava : Psychodiagnostika, s.r.o., 1991. ŘÍČAN, P. Ravenova zkouška pro dospělé. Příručka. 2.nd. Bratislava : Psychodiagnostické a didaktické testy, n.p., 1976. MINISTRY OF JUSTICE of Slovak Republic [online] dostupné: http://www.statistics.sk/pls/elisw/objekt.send?uic=2477&m_sso=2&m_so=7&ic=30& (cit.3.7.2008). MINISTRY OF JUSTICE of Slovak Republic [online] dostupné: http://www.statistics.sk/pls/elisw/objekt.send?uic=1695&_sso=2&_so=42&ic=57 (cit. 3.7.2008). ŠTURMA, J. - VÁGNEROVÁ, M. Kresba postavy (T – 76). Bratislava : Psychodiagnostické a didaktické testy, n.p., 1982.